American involvement in Southeast Asia began in 1954 when the United States government offered support to a corrupt but pro-American democratic government in South Vietnam and lasted until the fall of Saigon in 1975. While Congress never officially declared war, thousands of American soldiers died and billions of dollars were spent in attempts to contain the threat of communism in North Vietnam and prevent its spread to other parts of Southeast Asia. President John F. Kennedy began sending military advisors to Vietnam during his presidency, and in 1964, President Lyndon B. Johnson escalated the conflict under the auspices of the Gulf of Tonkin resolution. By 1968, there were over half a million American troops fighting in Vietnam. President Richard Nixon announced a plan for the Vietnamization of the war, and in 1970, he ordered troops to invade Cambodia in order to cut off enemy supply lines. Public support for the war declined, and in 1973, Nixon began to withdraw troops. The United States did not intervene when North Vietnam successfully invaded the south in the spring of 1975 and unified the country under a communist government. 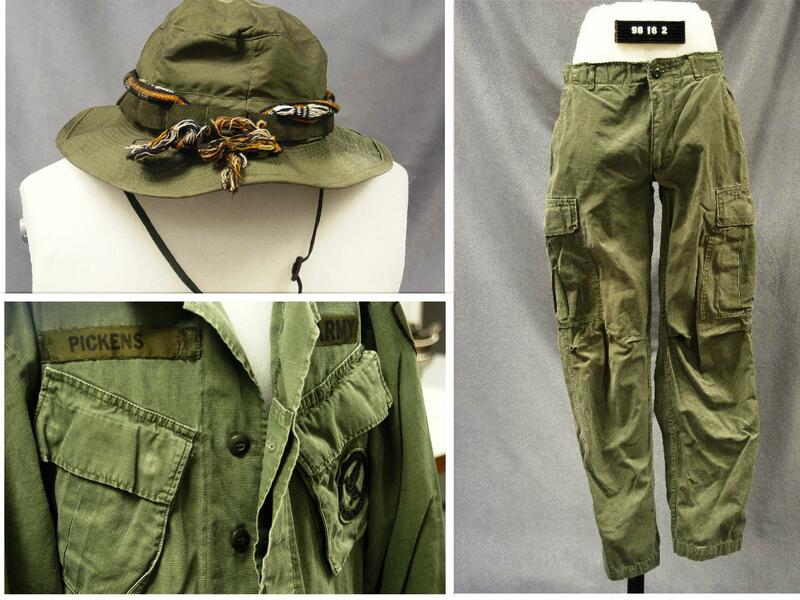 These fatigues were worn by Platoon Sergeant Larry Pickens, an observer in an OH6A (Loach) helicopter, in Vietnam from August 1969 to November 1970. After his tour, Pickens remained a member of the Nation Guard while also working as curator of Lichterman Nature Center. He donated his fatigues to the museum in 1998. After the war, a group of Vietnam veterans led by Jan C. Scruggs established the Vietnam Veterans Memorial Fund. The group raised money and sought Congressional support for a national memorial. In 1980, they announced a national design competition for the monument. Maya Lin, a 21-year-old architecture student, created the controversial winner. When the design was unveiled, many felt it was not monumental enough. However, it has become an icon. The Vietnam Veterans Memorial Wall is located along the National Mall in Washington D. C. and serves as a symbol of sacrifice and healing for Vietnam veterans and their loved ones. It bears the engraved names of the men who died or remain missing. According to the National Archives, approximately 253 soldiers from Shelby County died during the war. An additional nine Memphis men are still listed as unaccounted-for since their bodies were never recovered. Though millions of Americans visit the Wall each year, few realize that Memphis played a crucial role in its creation. 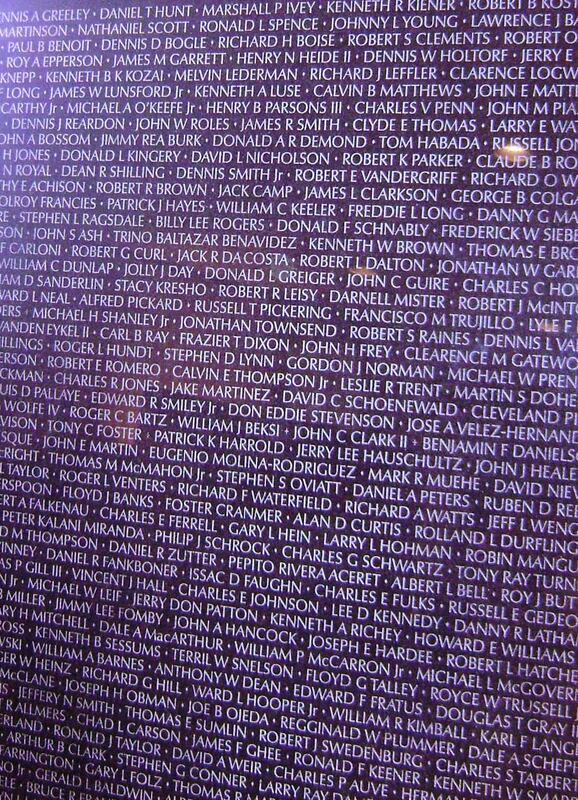 The Glasscraft division of Binswanger Glass, a Memphis company, won the contract to etch the names of 58,261 fallen soldiers into the polished black granite slabs that make up the Wall. The company submitted the pictured Architect’s Sample to the Memorial Committee in order to win the contract. When the company sold, they generously donated this sample to the Pink Palace. It is currently on display near the entrance to the museum’s mansion.